Felice Original: Taggers Together 4 New Zealand!!! Taggers Together 4 New Zealand!!! How true are those words? As Designers we have a multitude of design projects going on at the same time, we advertise, we read 100's of emails a day, we participate in blog trains, we manage Creative Teams/stores/blogs..... The list is never-ending for us, isn't it? But sometimes, real life throws us a blow and we need to step back, take a breath and re-evaluate our priorities for a bit. A tremendous number of members in our tagging & designing community have had their worlds turned upside down recently. I'm talking of course, about the devastating Earthquakes in New Zealand, centered in a city called Christchurch although the damage has reached hundreds of miles in every direction. At this writing, there are 97 confirmed dead, with hundred more still missing and unaccounted for. These are our online friends, our digiscrap store owners, our designing partners and our customers. Personally I have 3 of the aforementioned deeply affected by these quakes, one has lost a dear friend. I can't sit by and watch this type of suffering and just offer cyber hugs any longer - it's not enough. It is within OUR power to make a difference. huge collaberation and believe me it is not one to be missed. There are 47 kits spanning all 4 seasons. HOW DONATORS WILL RECEIVE "SEASONS"
I'm including this in case you get questions about the kit's distribution after the kit is released on March 13th. I recommend you send them directly to the blog to read it, but this is in case you prefer to answer them yourself. This information is all on the "How To Donate 4 Seasons" page on our blog. Once a donation is complete, the donator will automatically receive a receipt from the Salvation Army detailing their donation. This receipt does not have any credit card or paypal information on it, just the type of card used and donation amount. 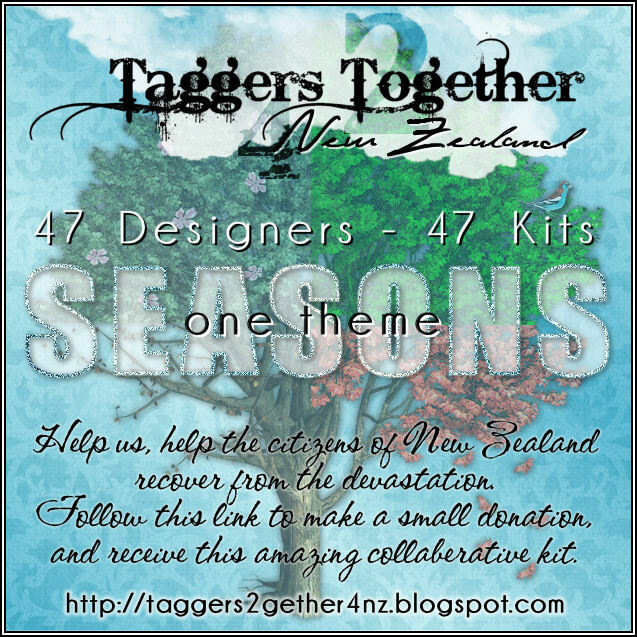 The minimum donation to receive the kit is $10 USD They're asked to please forward that receipt to me at this address - taggers2gether4NZ@gmail.com. Once I have their receipt I will send them the link to my 4shared account along with the password they need to download all 47 kits that make up Seasons. Please give me 24 hrs to get the links to them due to the volume of requests I expect to receive. If they do NOT hear from me with the link within 24 hours of sending it, I've asked them resend their receipt again. We all know that emails can be tricky sometimes and their email possibly was eaten by the cyber world. Please help us help New Zealand?? ?